. In the first section of this course these are the following things for you to do. create an assignment.htm page for your first assignment "Web Report Assignment"
. The purpose in discussing these various editors is not intended to make you proficient in making complete web sites, rather simply "empower" you with making a basic web page with which to complete your project for the course. You should burden yourself with learning HTML code from scratch, rather you should pick a WYSIWYG editor and use it to make your pages. Regardless of what editor you use, a basic page has some key structural elements which you need to know - even if you will not be the person making the web pages, it helps to understand these fundamentals.
. One of the characteristics of the "new economy" is that people cannot afford to be only aware of the theoretical aspects and ignorant of the practical aspects- things overlap too much. So, what we are saying is that you may be the person strategizing about the marketing aspects of the web page (and hire someone else to do the HTML) but you do need to something about the basics).
. Some of you may want to work on your website at home. 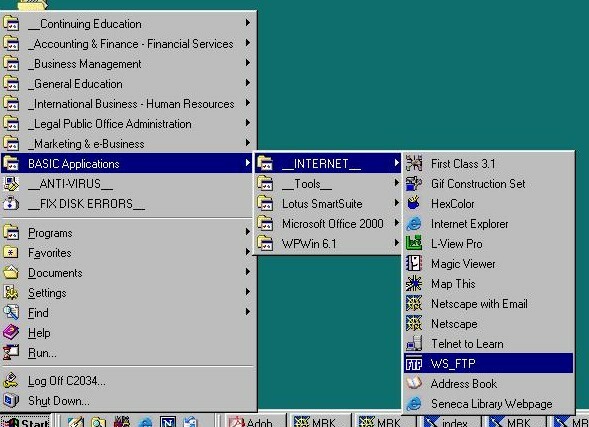 The easiest way to do this is download Netscape at home, and use Netscape Composer to edit your pages, and then download FTP at home, and upload your pages to the Seneca server. 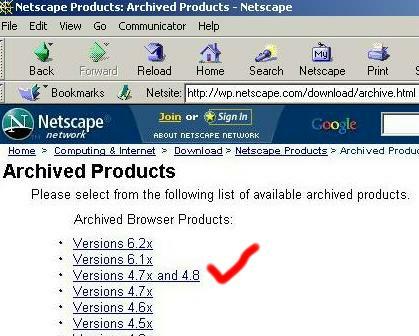 This is where you can get Netscape - netscape.com - however, this is a big site, best to get Netscape 4.79 - that version is the easiest to use as an editor and it will work fine for what you want to do. If you make a webpage in Netscape 4.79 Composer, it will allow the features to be shown (95%) of the time in I.E. 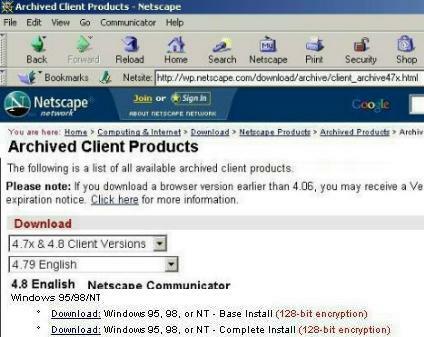 and Netscape. From http://channels.netscape.com/ns/browsers/default.jsp, go to "product archive"
Case Western Reserve University has an extensive web site about how to make web sites and the basics of HTML coding. This page specifically talks about the document structure tags in simple to understand format. Rick Darnell says that "one of the main drawbacks to working with HTML is that many Web page editors don't display a page the way it will look on a browser ...this situation is changing with the advent of WYSIWYG editors that display a page using the standard accepted by most browsers." Tag Editors - provide the author with direct control of the tags. Requires reasonably good understanding of HTML. Representational Editors (also called WYSIWYG editors) - use menus and wizards to allow you to roughly see how it will look, as you go. Requires minimum knowledge of raw HTML. Go to Tucows (click on icon to the left) to browse through several of the Advanced HTML editors. You will find HoTMetaL, HotDog and WPC on the list as well as others. HoTMetaL Pro, at www.hotmetal.com is the product of a SoftQuad Software Inc., a Canadian company based in Toronto. Various sources say HoTMetaL has the largest number of users. Homesite, which is now selling version 4.5, is also well know with experienced webmasters, and is easy enough to use for novices. This is a course taught at another institution but you are free to use these pages to teach yourself HTML cause the pages for the course are hosted by Prof. Richardson on his own domain.
. It is not advisable for MRK 610 students to spend a lot of time learning the HTML tags so you can "hard code" your own pages - it would be kewl, but,, too time consuming, better to know a few tags just so you can understand how to use them, and to understand how things can go wrong with a WYSIWYG editor.
. Here is an example of why you would need to know about the HTML document structure tags on a page, even if you were in marketing and someone else designed the page. To "get found" search engines use META TAGS as part of the information they use to index and retrieve pages. META TAGS are located within the HEAD TAGS on a page. This information is a collection of choice words used to help the page rank high in searches - if you know this, you can look at the HTML code on competitors' pages and see what words they used in their META TAGS, and change your META TAGS accordingly. The words in the HEADER TAGS, between the TITLE TAGS, are the words that show up when someone bookmarks a page. This would be helpful for you to know so you can change those words to reflect what you want viewers to expect. <title>outline610a</title>, which shows up in the upper left hand corner of the browser when you are viewing the page, and are the words which show up when you bookmark this page.
. 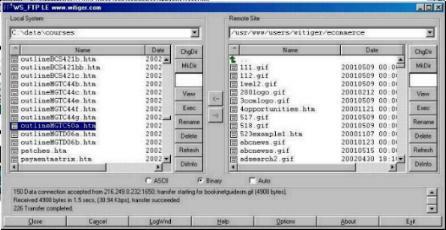 In order to see the wide diversity of images and sound available on the WWW in 2003, it is necessary to obtain particular plug-ins [also called Browser Extensions] because Netscape and Internet Explorer (the two most popular browsers) are not always installed in a way that allows you to see 95% of all the images, and hear all the audio, on pages you might visit. 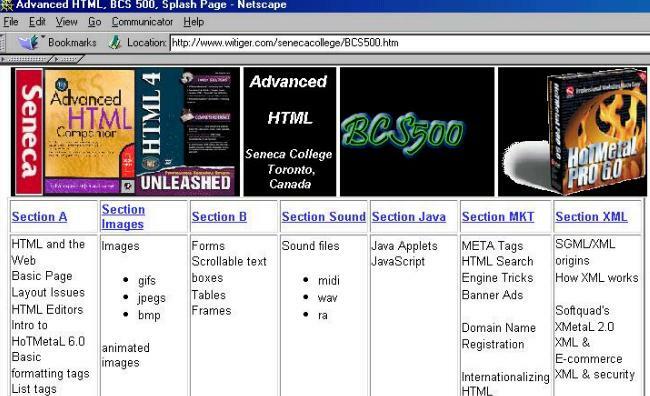 where to find an image editor when you are using the BSC labs at Seneca.
. The reason why you need to familiarize yourself with a good image editor in making pages, is because the images you collect to put on your page may need to be resized, or cropped, to fit more appropriately. Smaller images will help the page load faster so do not use large images unless it is necessary, always try to crop you images, or make them thumbnails which can be clicked on to view a larger version. Frontpage, you need to "upload" these pages to the server which is hosting your site. This means your ISP must give you a URL, something like www.isp.com/~mysection and a password, which you then use to upload. Uploading is easy using WS-FTP. 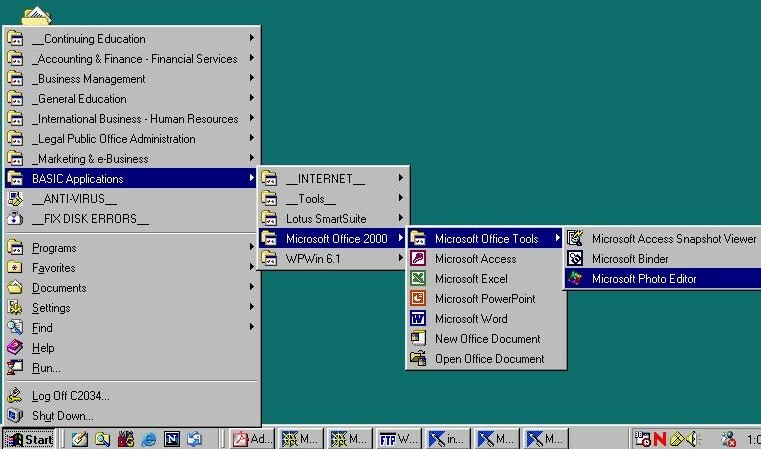 It's like using Windows Explorer - with the left hand of the screen showing the files on your computer, and the right half of the screen showing the files on your server.
. 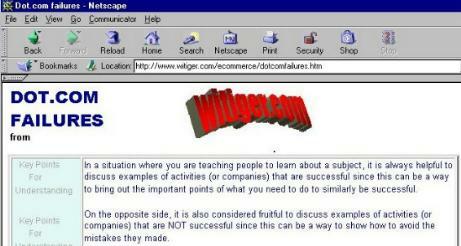 If you do not have WS-FTP, you can download it from witiger's site. go to. Terminology It used to be in 1998 / 1999 that e-commerce was the general term used to explain the aspects of setting up a web site to actually conduct transactions over the WWW and e-business was a catch-all phrase for everything else. - example TV has been around for a long time - but only a small percentage of all companies advertize on TV !!
. Of all the environments noted above, Witiger personally believes that the Competitive Environment has the biggest impact on E-business since so much of your success and failure depends on what the competition does - and if you have no competition, your success will attract people to copy you so you will get competition. from the introduction to Kim Bayne's book . You do not have to buy the Bayne book, it is here just for reference. Bayne has some wise words at the beginning of the book about the "environments", which merit summarizing here. "When the first edition of the book was published, the climate for Internet marketing was very different. 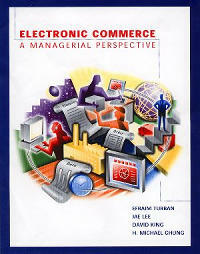 Much has happened in the past few years to change the e-business landscape . For one thing, the major players are no longer "pure Internet players" ... The Web is now just another mainstream den of big business ...today, companies jump online without much forethought or are driven into the situation by outside forces"
Let's look at those "outside forces"
Bayne says the purpose of her book is "you will be able to create a coherent and integrated Internet marketing presence to enhance your overall general marketing communications program"
. This statement of Bayne's presumes 2 things.
. When the professor is explaining.